At what point between A and B do you become a tourist? At what point are you part of the problem? At what point do you turn around? These questions boil to the surface as I sit in the back of a dented white van. It's difficult to discern shapes in the darkness. I catch sight of the skeleton of a palm frond and a cluster of chairs, of a chain link fence glittering in the headlights. Our taxi driver is negotiating with the strikers. He wants to know if he can drive us to our apartment. No, no, they say, turn around. Turn around. Eventually the strikers acquiesce and we are one of the last cars permitted passage. Watching the sea ripple past, I wonder if we should have turned around. The strike lasts several days. I am used to las huelgas from living in Chile. Disruption was the norm. As a tourist, however, I feel distanced from this strike. I sense the impact of it only because the strip of beachfront where we are vacationing is pretty much empty. 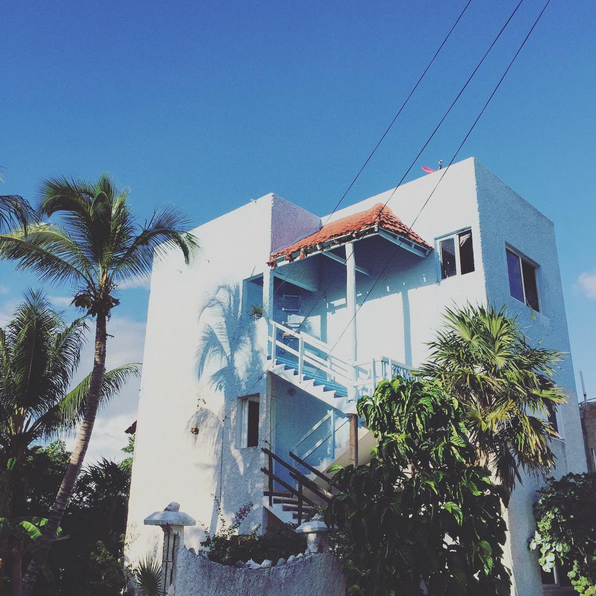 No one can get in and those already renting rooms in Akumal's colorful condos can't leave. As my family later learns after speaking with several protesters, the strike is in response to a new hotel that wants to privatize the beach. Talking to the residents fills my heart with a special kind of pain. Like many of the communities dotting the Riviera Maya, the tourism industry both gives and takes. Cancún's epic stretch of high-rise hotels is eroding the coastline. The artificial golf courses bracketing Playa del Carmen gobble up water and spit out pesticides. Snorkeling expeditions have driven many species, particularly sea turtles, deeper into the ocean. The American appetite for a sun-kissed sanctuary is infringing on sacred land. After the government and protesters reach an agreement, I return to the site of the strike. I am surprised at how quickly traces of disruption have been erased. There are no imprints in the sand, no crushed aluminum cans, no vestiges from the hand-painted signs. Over the course of the last few years, nearly every trip I've taken has been to visit with family and friends. Traveling for this particular purpose meant that I never really felt like a tourist. I was at home in my loved one's homes, whether in urban San Francisco or in rural South Africa. To be a tourist in Mexico unsettled my sense of self. More than anything, returning to a role I had estranged myself from raised many questions about what it means to truly travel sustainably. The pursuit of sustainable travel is rife with paradoxes. Jet fuel is crazy carbon consumptive and assessing the intertwined environmental, social, and economic impact of tourism is just damn tricky. The Riviera Maya's rapid development is both a cause for the decline of natural ecosystems and an impetus for the conservation of resources. This is true for destinations such as Patagonia and Ecuador as well. The desire to see pristine wilderness can spurn unregulated development. This in turn, can provoke effective intervention from environmentalists. That I get to wrestle with this guilt and confusion, that I am able to explore these questions, is an incredible luxury. I don't take it for granted. I loved the chance to see Mexico. I loved cracking open coconuts with my brother and swimming in milky midnight blue cenotes. I feel very grateful to have had the opportunities I have had to travel. And it's because I am flooded with this gratitude, because I've been gifted this privilege, that I am responsible for digging in deep. No action should be without thought. No thought should be without action. What does it mean to be a tourist? What does it mean to be part of the problem? What does it mean to turn around? These questions are knotted up in so much history that entangling a precise answer is near impossible. No two places are the same. No experience is alike. Travel can do good and cause harm. Maybe being a tourist means being uncomfortable. Maybe it means accepting that you will not always have access to electricity and to the food you like and to the stores you are familiar with and that is okay. Maybe it means researching the carbon footprint of your flight and calculating choices in reaction to cost. Maybe it means reconsidering "costs." Maybe it means doing your part to clean up the proverbial campsite. Maybe it means paying greater awareness to what lessons you will bring back. Maybe it means never leaving. Maybe it means reading Ivan Illich's "To Hell With Good Intentions." Maybe it means defining what purposes matter most to you and acting only with those intentions. Maybe it means recalibrating travel to encompass hikes in your hometown, trips to the neighboring city, short train rides to see friends. For all these maybes, it's a certain that the conversation on the ethics of travel is ongoing. Our world is increasingly becoming more interconnected, more interdependent, for better and for worse. Tell us how you go, and where and why. Sharing our thoughts can help us better shape our actions.